Get bigger muscles with purposeful workouts and a quality diet. Making good food choices is every bit as important as focused hardgainer workouts. 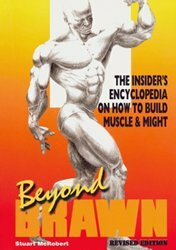 Before you read any farther, though, you have to decide if you want to deal in reality and if you want to add a lot of fat in your quest for more muscle size. The reason I asked that is because when guys make a decision to build muscular size, they scour the Internet for "secret workouts" that make you look like an NFL linebacker in 12 weeks...and "exclusive protein shake powder." Neither exists. * Muscle growth is progressive and SLOW. You simply CANNOT get big fast without putting on a bunch of fat. * If you truly want to put on muscular size, you need to look at a 12-month program. No lie. Professional athletes know they can only put on 1 to 1-1/2 lbs of rock hard muscle per month. You may be able to put on a little more, but not by much. * In order to build bigger muscles, you must make good food choices. No idiotic forced eating, no gorging on protein shakes. * Forget fluff exercises like wrist curls, leg extensions, triceps kickbacks, etc. If you truly want to get bigger muscles, your focus will now be on strength-building lifts that make you sweat, breathe hard, and get red in the face. * Squats, deadlifts, dumbbell cleans, military presses, weighted dips, weighted pull-ups, heavy shrugs, and various bench presses will all be part of your routine. To gain muscular size and keep off belly fat, you must workout like an athlete. * Following a proven program like The Truth About Building Muscle (for beginning lifters) or Optimum Anabolics (for more advanced lifters) will benefit your goal to get bigger muscles. What do women find attractive physically in a man?